In this tutorial I will explain the microwave dyeing technique. 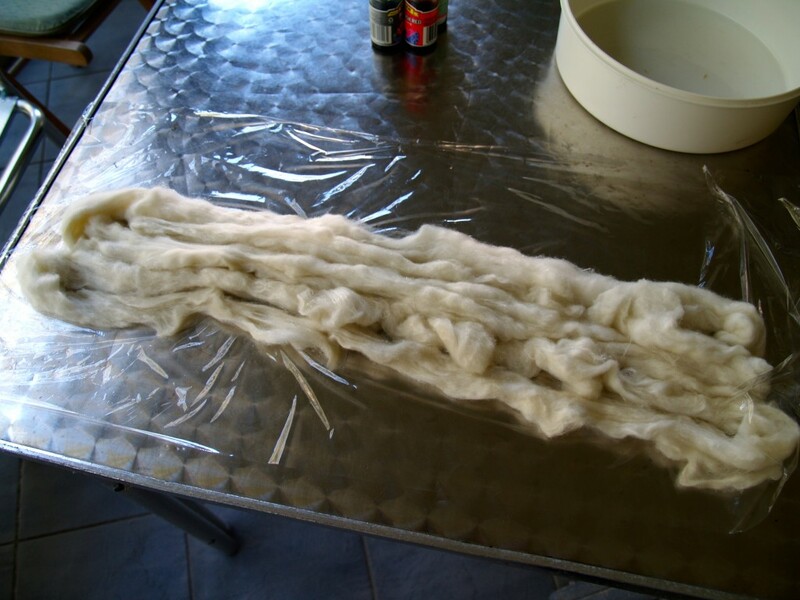 This can be used for protein fibres such as wool, alpaca, mohair, silk, and other animal fibres, but cannot be used for cellulose fibres such as cotton, linen, and other plant fibres. First, get everything you need together. 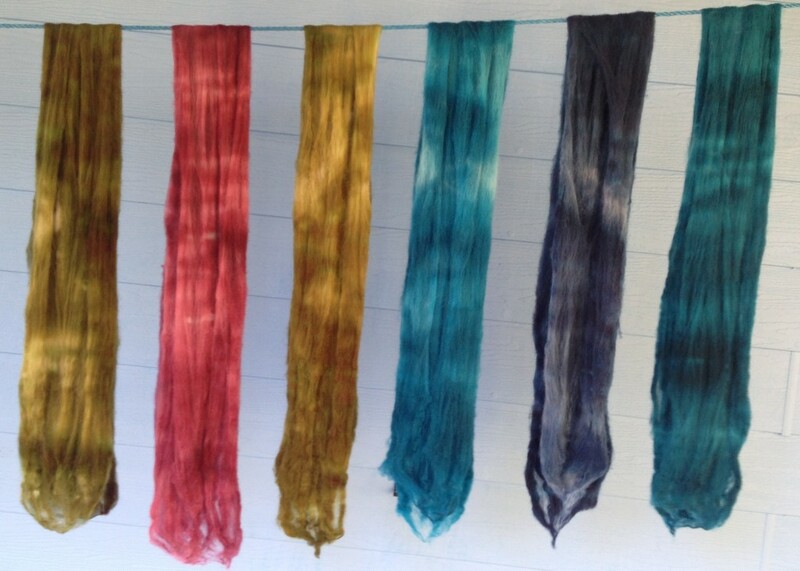 I write everything down in my dye book so that I can, as much as possible, recreate what I have done, although in reality this is difficult as different batches of fibre, even from the same animal, will take up varied amounts of the dye. You will need stainless steel or glass bowls and measuring cups and spoons and glass droppers, a measuring jug and a microwave container with a lid that has a steam hole, or some cling wrap if you have no lid. Digital scales are useful for measuring the fibre, but you can get a rough idea of the weight using traditional kitchen scales. For the dyeing itself you will need water, white vinegar and food colouring. I always keep red, yellow, blue and black Queen’s food colouring in my cupboard. Gloves are probably a good idea too. First, soak your fibre (I use 50g or a multiple thereof) in a bowl of water to cover for at least an hour so that water permeates all of the fibre. This will allow the dye to reach through your fibre more easily. When ready for dyeing, squeeze gently to get a fair bit of the water out, but it will still need to be quite wet. Lay the fleece or tops, or your other chosen fibre on a piece of cling wrap. If not using cling wrap then lay the fibre straight into the microwave container. Now is a good time to put on the gloves. Make up the dye mix as follows: use 3/4 cup water, 1/4 cup white vinegar (this is used as a mordant, or fixative agent which makes your fibre colour fast) and 2 teaspoons food colouring for each 50g of fibre. If you use more food colouring then not all of the dye will be taken up in the dyeing process and it is just a waste. If you want paler colours then use less dye colour. Stir the dye mix and then drizzle over all the fibre. 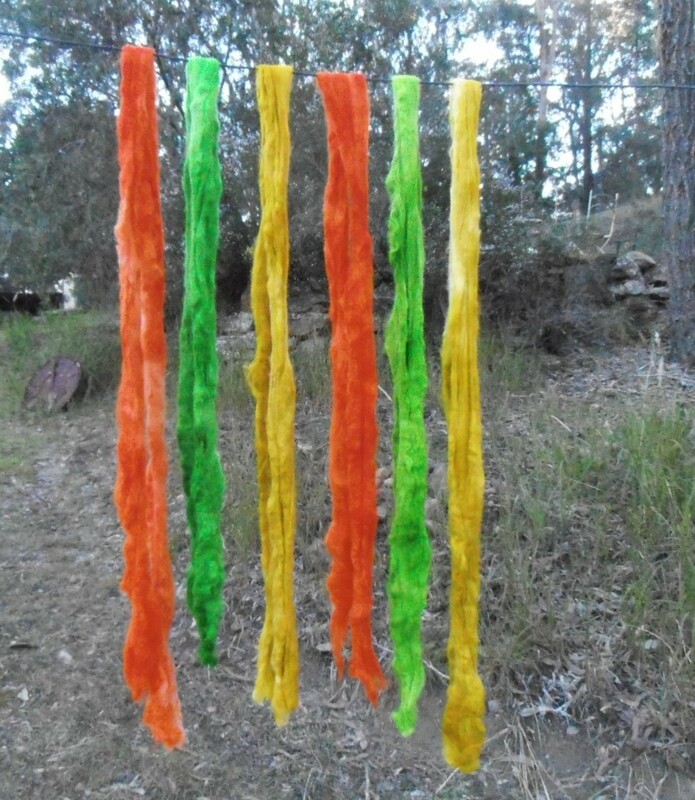 Fold the cling wrap around the fibre to seal if using, then squeeze until the dye has soaked through as much as possible. This will take a bit of experimentation to get the amount of dye and squeezing to your liking, but stick with it. If not using cling wrap then add a bit more water and then put the lid on the container. Place the container into the microwave and set the timer for about ten minutes. The time will depend on the wattage of your oven. A higher wattage could mean a little less time in the microwave so experiment and start with less time. Check to see that there is still enough water before putting in for more time. After ten minutes check to see how much dye has been taken up by the fibre by pressing down to see the colour of the water. If there is still a fair amount of colour in the mix then put back into the microwave for a few more minutes. Then leave the fibre in the container to cool so that the fibre takes up as much of the colour as possible. As the mix cools, more dye will be taken up by the fibre up to a point. 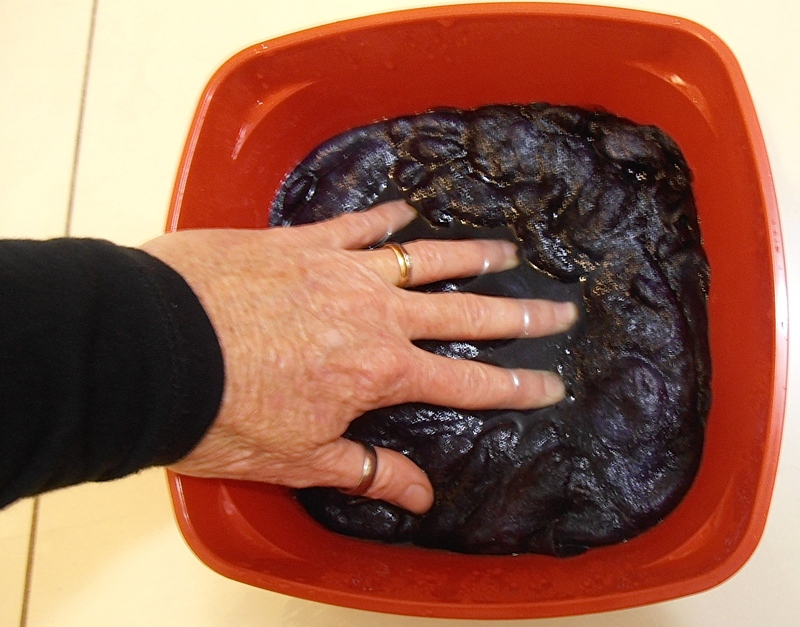 You can see that all of the dye has been taken up by pressing down on the fleece to see if the water is clear. Obviously don’t put your bare hands in there if it’s still hot. 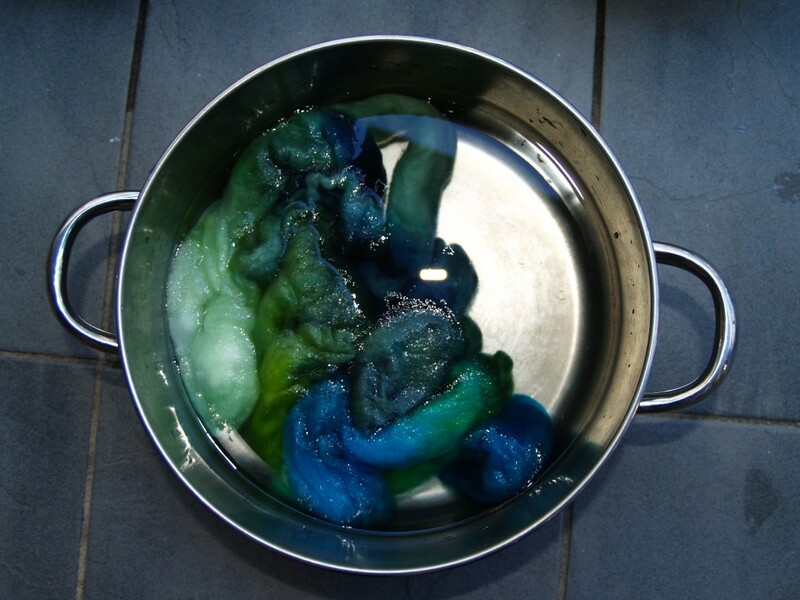 Now you can rinse your dyed fibre until no more dye washes out and the water runs clear. Often my dyeing uses all the dye so I am really just rinsing out the vinegar. Squeeze gently to get out most of the water, but don’t wring as this can lightly felt your fibre, which you don’t want. This is especially true for delicate wools like superfine Merino. Then hang your wonderful creation out to dry. Spread the fleece apart as it dries. It will spread much more easily if it is partially dry. Now you are ready to felt, card, or spin, or perhaps draft and knit straight from your unspun fleece if you’re really adventurous! This is a basic recipe and you can modify to your tastes. 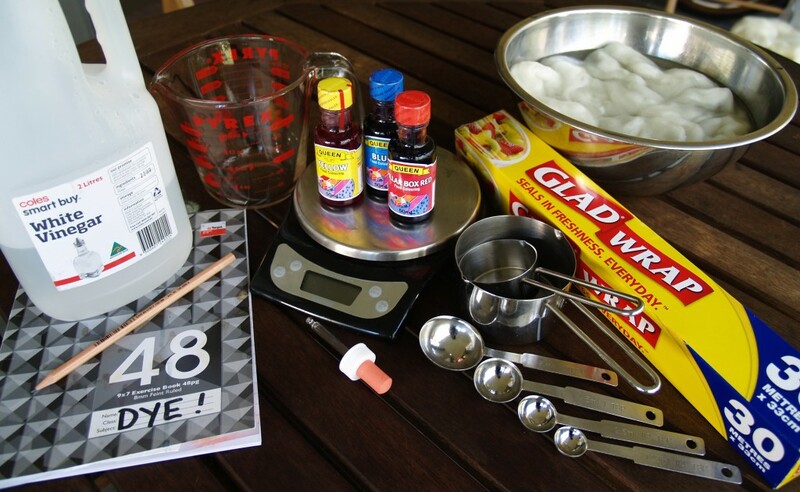 You could try soaking in water and vinegar mix, then using watered down food colouring in squirt bottles to colour the fibre more precisely, or paint it on with a paint brush. The possibilities are limitless if you use your imagination.